In this section of the store you'll find a varied selection of books on Lake District walking. 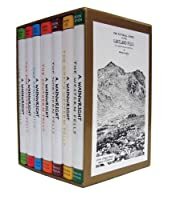 There are straightforward guides to the routes, pre-eminent among which are the books of Alfred Wainwright (particularly his Pictorial Guides to the Lakeland Fells), and the more recent Fellranger Guides of Mark Richards (page being added shortly). Special interests and needs: There are special-interest walking guides for those wanting to include landscape photography, geology, bird-watching or other interests in their walks. Then there are books of Lake District walks designed especially for those who, for example, have limited mobility and need easily navigable paths with no styles, or people who like to have their dog along with them on their Lakeland walking holiday. The selection above is very varied, to meet a wide range of needs and preferences. There are also some books that are not really guides but tell the stories of their authors' Lake District walking experiences. Finally there are books on the long-distance routes such as the Cumbria Way, Wainwright's Coast to Coast, or Ron Scholes's alternative coast to coast route, the Ravenber Way from Ravenglass to Berwick. The link in this paragraph connects to a page specifically devoted to these more demanding multi-day walks.